August 14th, 2011. I’ve written it down because it’s not often you are privy to the beginning of music history. You see, I wasn’t even a twinkle in my father’s eye when The Beatles were an up and coming act. And I was just a child and never got to see when guitar greats Jimi Hendrix, Eddie Van-Halen and Randy Rhoads began and all took it up a notch. Alas, I was starting to feel that being part of the beginning of something special just wasn’t in the cards for me. Last night though, I finally got that chance when I saw the very first Adrenaline Mob performance in Allentown, Pennsylvania. 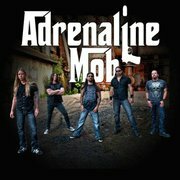 Adrenaline Mob is the new project from some of the most talented musicians around. Featuring drummer Mike Portnoy (Dream Theater, Avenged Sevenfold), lead vocalist Russell Allen (Symphony-X), guitarists Mike Orlando (Sonic Stomp) and Rich Ward (Stuck Mojo/Fozzy) and bassist Paul DiLeo (Nena). Having never seen an arsenal of musicians of this caliber come together before I didn’t quite know what to expect. But as the band took the stage to the familiar sounds from The Godfather movie and tore into Psychosane, the first song from its debut self-titled EP, any doubt I had as to whether or not they could pull it off was gone. It truly was a headbangers paradise as the band wooed the audience with songs like Hit The Wall, Believe Me and the Black Sabbath/Dio classic (and very appropriate) Mob Rules. Mixing in a few songs from their soon to be released full length album, Russell Allen told the audience “This next one’s our ballad” and I found myself wondering if this would be just another gratuitous throw away song. I was pleasantly surprised to find that their “ballad’ was actually on par with all of the other songs and Mr. Allen’s vocals were both smooth and powerful. I felt like part of a brotherhood listening to Paul DiLeo’s killer bass grooves and sonic euphoria while shaking his head along with the rest of us. I’ve never seen Mike Orlando perform before and as a guitarist myself I stood there in awe as I watched him shred. He is one of the most phenomenal players around and makes it look so easy. Afterwards I asked him how long he had been playing and he told me “About a week”. Very down to Earth guy. What I should have asked him was if he was available next week to give me lessons. Rich Ward played to the crowd showcasing his amazing talent and at one point allowing members of the audience to play his guitar while he held it over them. I wished I was down front so I could have also been a member of The Mob for just one night. As for Mr. Portnoy, well what can be said that hasn’t already? The man is a genius, one of the greatest drummers ever and also one of the nicest guys you’ll ever meet. Just a year out of leaving the mega band Dream Theater, Mike is back with a vengeance. After a thrilling 75 minute performance, the band exited the stage once again to The Godfather theme along with intentional feedback from Mr. Ward’s guitar. Indeed, there was no better way to end the beginning. If you haven’t done so already, I highly recommend picking up a copy of the Adrenaline Mob EP and seeing this band on their current tour so one day, like me, you’ll be able to say: “I was there when it all began”.